In New York City there was this wonderful little restaurant whose specialty was risotto. The name of the restaurant was Risotteria. It was located in the West Village on Bleecker St. They prepared a multitude of different risottos including a fabulous mushroom risotto. Unfortunately, they’ve closed but they inspired me! 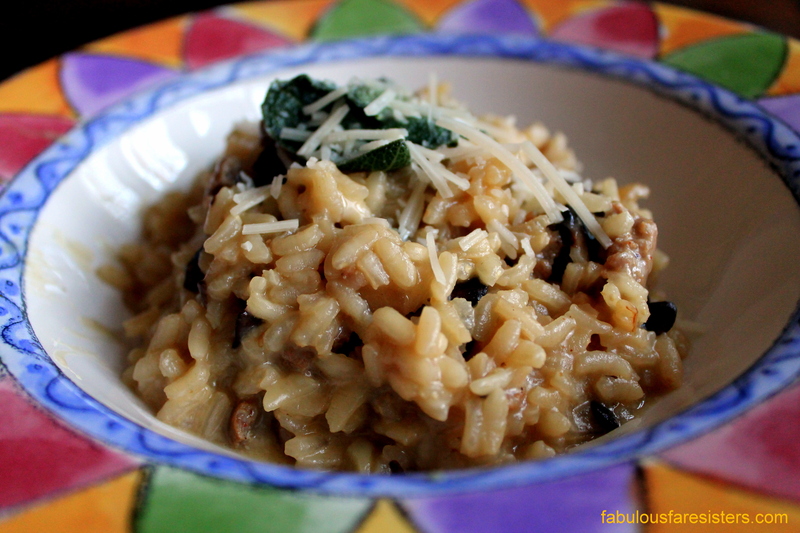 I also prepare a mushroom risotto but mine is flavored with andouille sausage along with cremini mushrooms. I top it off with sage sautéed in butter, a sprinkling of Parmesan cheese and a swirl of truffle oil. It’s creamy and delicious…Enjoy! In a large skillet, heat 1 tablespoon butter on medium-high heat. Add the mushrooms and sauté for 5 minutes. Add the onions and sauté an additional 5 minutes. Stir in the arborio rice, the minced garlic and salt and sauté another minute. Pour in the wine and cook until the liquid absorbs. Add chicken broth, one ladle at a time (about 1/4 cup each time), stirring between each addition of chicken broth – allowing the broth to absorb slowly into the rice; this can take up to 20 minutes. In the meantime, in another skillet, break up the sausage into bite sized pieces and cook until done. Set aside. To the tender risotto, stir in the zest, lemon juice and Parmesan cheese. Sauté the sage leaves in 1 tablespoon butter until lightly crisp. 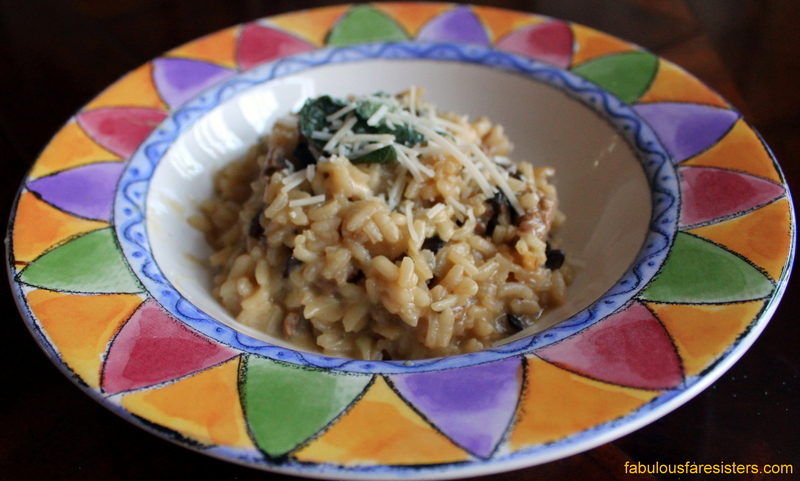 Top risotto with buttery sage leaves and additional Parmesan cheese. If you have truffle oil in your pantry you can drizzle a little bit on top – it gives the risotto an earthy aroma and flavor. I’m glad you reblogged this, I missed it first time around! I have a sage plant and I would love to make this with it, yay! Yes, probably a good idea, thank you! Yum! This recipe sounds so decadent and delicious. Thank you for sharing.